It's a little hard to see in this picture, but our special surprise waterfall at Lake Crescent is back. It's about three miles from the East Beach Road trailhead, in the rocky area near the point. 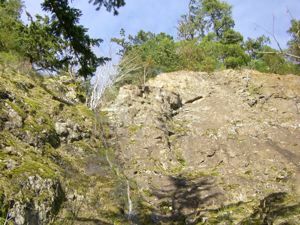 If you look up, you can see the little falls. It isn't quite as wet as 2006 when we last saw it. The water vanishes underground, so you can walk by it dryshod.